Mozilla released on Thursday a new version of its Firefox web browser for Apple's iOS mobile operating system for iPhone, iPad, and iPod touch devices enabling Tracking Protection by default and adding some new features. 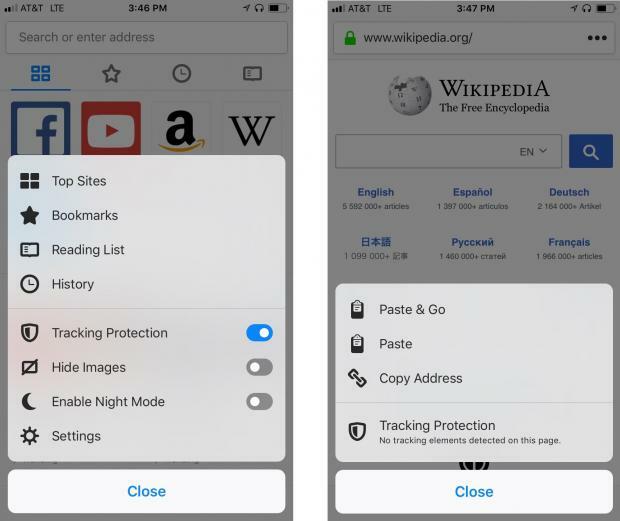 The biggest change in the Firefox for iOS 11.0 release is the enablement of the Tracking Protection feature that keeps websites and online services from tracking you on the Web by default for both regular and private browsing. Update Firefox for iOS right now form the App Store then simply tap on the menu button and you shall see Tracking Protection listed there, as well as a notification if any tracking elements were detected on the current web page. "At Mozilla we’ve always believed it’s important to respect people’s privacy and give them the control to decide which information they want to share, and what information they don’t. Now more than ever consumers are demanding this from the companies with whom they share their data," said Mozilla in the blog announcement. Mozilla also said that it beefed up Firefox for iOS to load pages faster when tracking protection is enabled by default. Therefore, if you choose to use Firefox as default web browser on your iPhone or iPad, you might save mobile data usage, as well as to prolong the battery life of your device. The Firefox for iOS 11.0 release also adds some new features for iPad users, including the ability to re-order tabs so you can better organize and prioritize your most used websites. To re-order a tab, long-press on it and drag it to the left or right. Check out the attached screenshot below to see it in action. With iOS 11 implementing drag and drop support between apps on the iPad, you'll now be able to drag and drop links from the Mozilla Firefox web browser to any other app you have installed on your iPad, whether it’s Mail, Messages, Twitter, or WhatsApp. Check out the attached screenshot below to see it in action.